A gorgeous and detailed new book from Dawn Publications makes sure that we know it’s not only “still waters” that run deep — prairies have a lot going on beneath the surface as well! The Prairie That Nature Built will delight eyes and ears with its story of the ecosystem upon which a prairie’s flora and fauna depend. 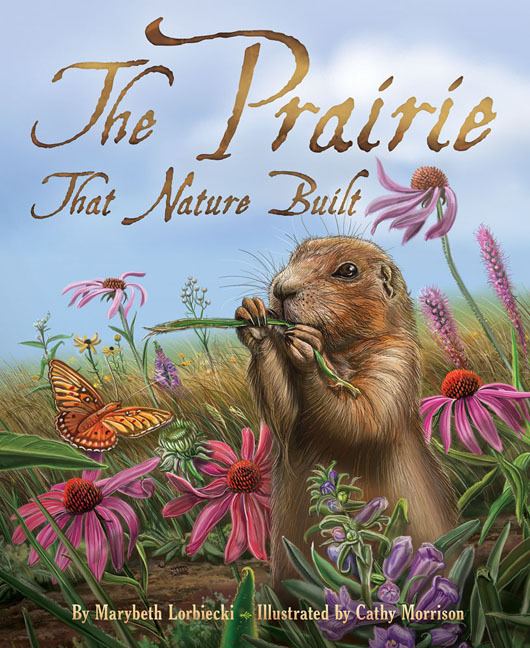 Author Marybeth Lorbiecki has created a rhythmic and rhyming text that shows the interconnectedness of the smallest worm to prairie dogs to rabbits to buffalo. She builds the story of the prairie to show the ecosystem’s beauty as well as its reality. Illustrator Cathy Morrison adds to the words with realistic, but accessible digital drawings. The detail is both beautiful and educational. My children spent a great amount of time finding and naming various animals and plants on each page.